The following is a preview from our DVD: "6 v 6 – A Dynamic Model For Technical and Tactical Training"
Scroll to the bottom to see a preview of the DVD and Warm up. The warm up illustrates the timing and quality of both the passes from the midfielders into the forwards and the forwards back to the midfielders. The back three move the ball around between them and the forwards move into the appropriate passing lanes. This exercise teaches visual cues of passing and checking. The back three, plus the goalkeeper, keep possession of the ball. They read the visual cue of when to pass sideways and when to play ball forward for strikers to rebound. Midfielders reading visual cues and strikers timing their checks. Midfielders are allowed to dribble over restraining line and find the 2 v 1. Players can dribble, three man combination or wall pass over restraining line. Restraining line removed. 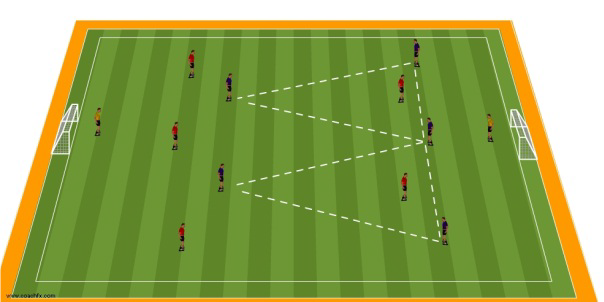 Encourage players to keep 1-3-2 shape.